Right Mouse Click - explanation of terms. Right Mouse Click on Yourself - (most of these are on the Edit menu at the top of the screen). 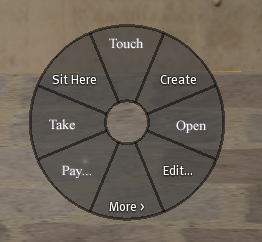 This is the pie menu that comes up if you right mouse click on yourself. Groups: You can join a maximum of 25 groups. Joining groups enables certain rights to do certain things. For example, if you are a member of "Education Online Student" group. This enables you to go to the Education Online Headquarters. It also enables you to receive notices of events, important information or receive inventory items. You may join other groups to "camp". Camping is the term used to sit somewhere or do something to earn money (Linden dollars - the currency used in Second Life. Linden dollars is of the ratio approximately L$250 is equal to US$1 - so you might have a lot of money in your account, but in real terms, it won't be worth much). So, you might have to have your Group "tag" on when you go somewhere, particularly if it is camping. This is where you can change your Group, or make it Active. When in Groups you can also change the "info" so that you don't receive Group Notices or have the group name listed in Your Profile. Profile: You can edit your profile to let people know a little bit about yourself. Please be very careful what you write here. It is best not to say too much about yourself. Keep it simple. The first page, 2ndLife - a little about yourself in Second Life, Web - any web page that you are associated with, Interestes - tick boxes to let people know the things you are intersted in, Picks - your favourite places, Classifieds - ads, 1stLife - where you can write something about your Real Life - don't disclose too much, MyNotes - this is where you can write things about the people you meet such as where you met them, who they are. Noone can see anything that you write here. Appearance: This is where you can change the way you look. You can change your body shape, height, size, colouring, hair, nails, the shape of your head, your hair colour, length, your eyes colour, nose, mouth, chin, torso, legs, etc. You can also change your clothes if they are modifiable, for example, change a pair of jeans length. You will have to experiment with this. You can also save full outfits here - once you have changed yourself so that you are happy with how you look, you should save this (renaming in case you want to go back to the original). Take Off: This is where you can remove clothing, such as take off a jacket. You need to be careful in case you don't have clothing on underneath that you thought you did. You can also detach objects here, such as hair. When you first start Second Life (SL), you are given hair. Most people, after a while, want to change this and it is usually in the form of a wig which is detachable. Gestures: You can do gestures such as appearing to clap and cheer if at a concert. There are many to choose from. Friends: This is where you find your list of friends. Those in bold are the ones online. With Friends, you can send them a message (IM/Call) that only they see. You can look at their Profile, you can Teleport them to where you are, you can Pay them money, you can Remove them and you can add friends. Stand Up - After you have sat somewhere, you need to Stand Up. 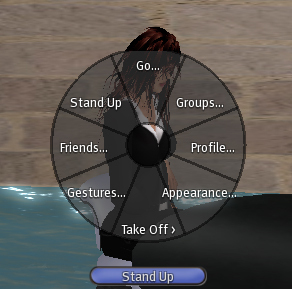 There is also a blue button on the bottom of your screen where you can click to stand up. Go: This enables you to go to a location - such as across the room. Right Mouse Click on Environment - Many of these have been explained above. However, there are a couple that haven't been discussed. Touch: This enables you to touch something. Create: This enables you to "build something". Open: This enables you open inventory items that require "unpacking". This means that you may have something you cannot use straight away because it needs to be opened. It needs to be "rezzed" (placed on the ground in an area that enables you to do so such as a "Sandbox") and then opened. Then the items can be copied into your inventory ready for use. Remeber to "Take" the item that you placed on the ground so that you don't clutter up the environment. Edit: means that you can make alterations to an editable item, such as making a hat sit on your head better, or moving a chair across the room (if you are in an area that enables you to do these things). Sit Here: You can sit on an object, such as a chair, if it enables you to do so. More: There are more options here, such as returning inventory item, taking a copy, deleting it or reporting abuse.